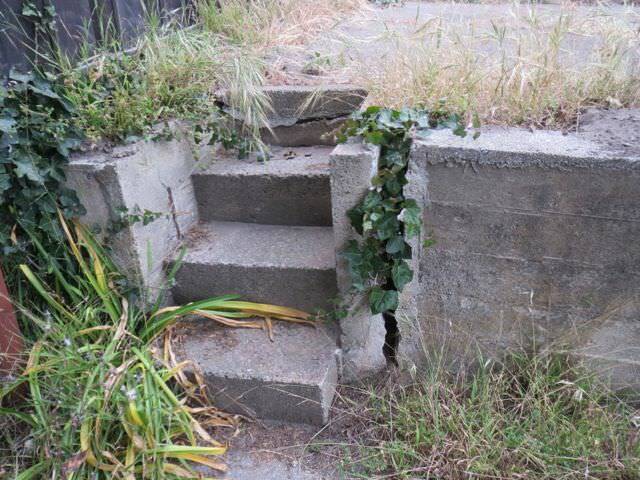 This residence in the outer sunset currently has crumbling concrete retaining walls/steps, terraces that slope and no foliage excepts for weeds. Not a very inviting environment for a young couple with a new baby. 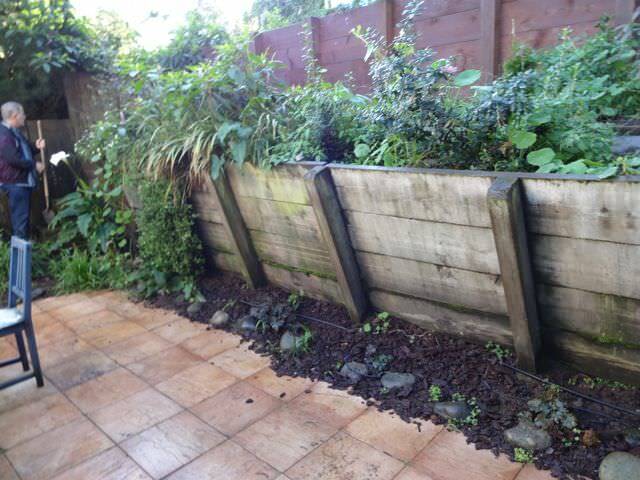 We were asked to provide a makeover, with a set strict budget and to include a deck, new steps, fix up the walls, turf and plants. We were shown some photos of elements they liked and we took it from there. Below are two photos of before. 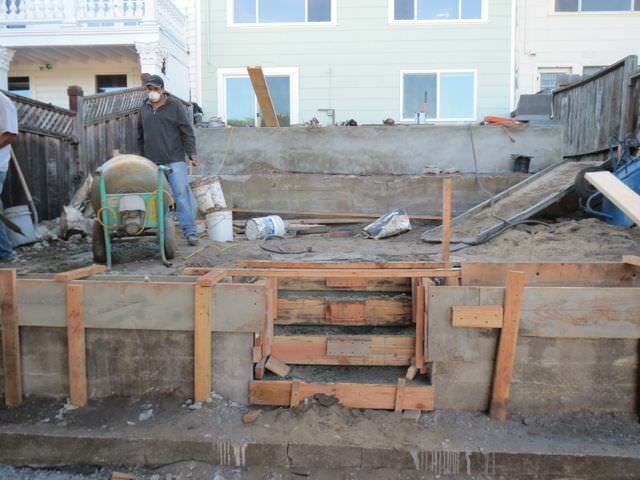 We started with demo, relocating steps and reinforcing the existing walls. 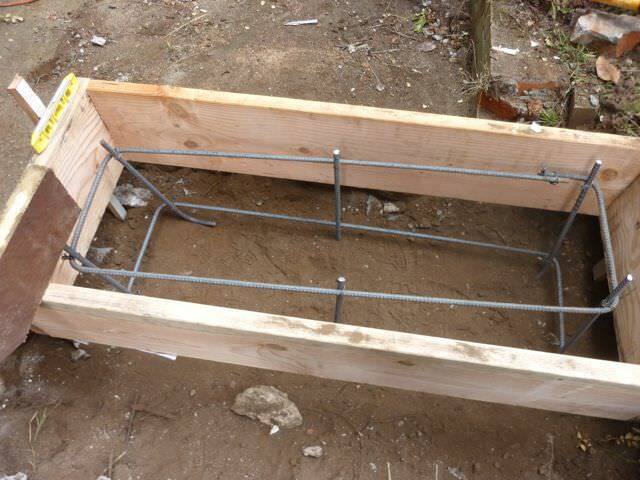 Below is a shot of a massive concrete bench that we formed and poured. It serves as as a safety barrier between the two terraces, a platform in which to tie the deck that we will be installing and also seating. 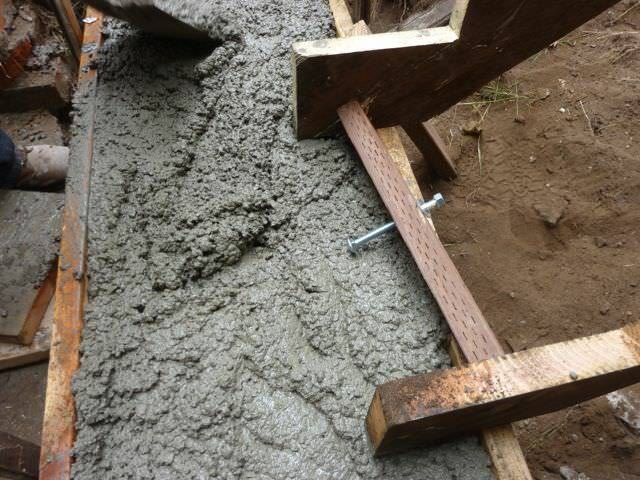 Adding new concrete to existing concrete must be done with great care. 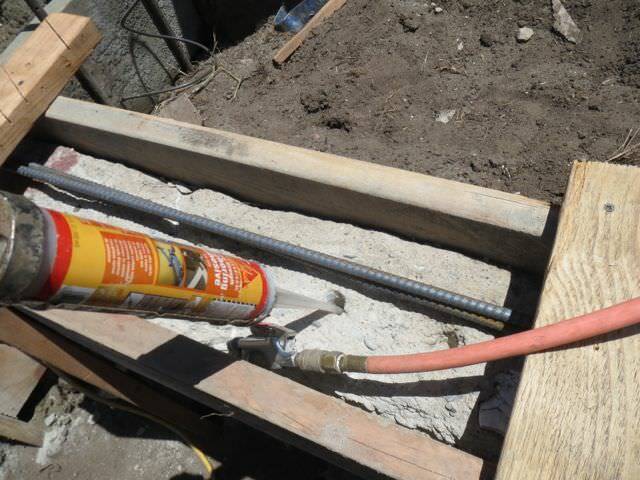 The natural tendency is for new concrete to pull away from old concrete due to poor bonding and expansion and contraction of concrete. 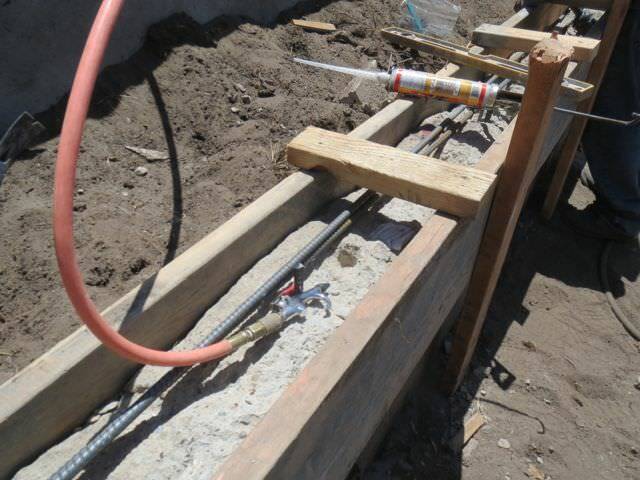 We minimize this by anchoring rebar to existing concrete with a epoxy resin as seen below. 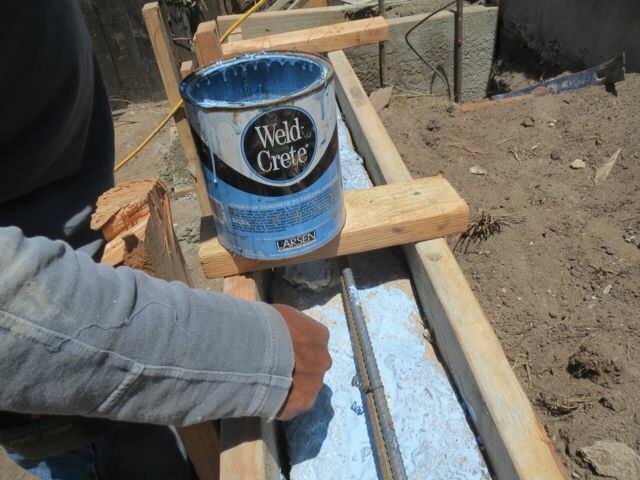 We also coat all surfaces of existing concrete with a bonding agent called Weld Crete as seen below. Job complete. 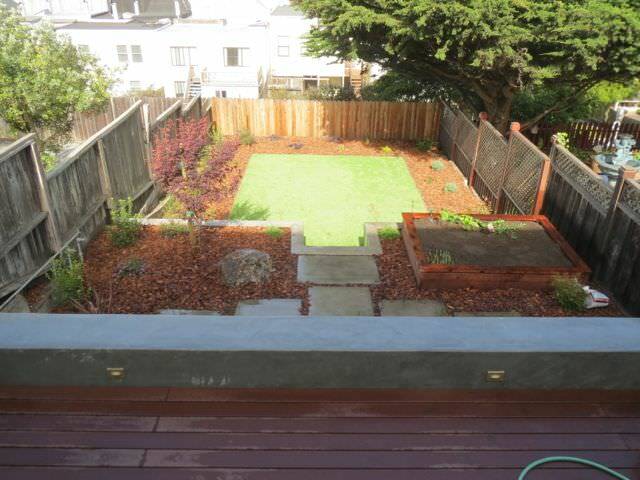 Three new level terraces, new steps, an organic vegetable garden box, TREX deck and artificial turf. Also installed were auto irrigation, lighting and plants. 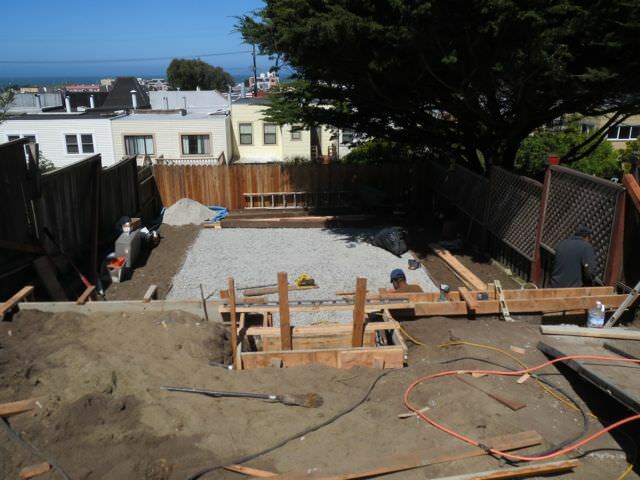 This project brings us to the Buena Vista neighborhood in San Francisco. We’ll be replacing this wall with something much stronger. A concrete wall is of course the most durable lasting 80 plus years but if budget is a factor, pressure treated (PT) timber is the way to go. But not all PT walls are constructed equally as you can see. With the support post being the weakest link, failure occurs here in most instances. 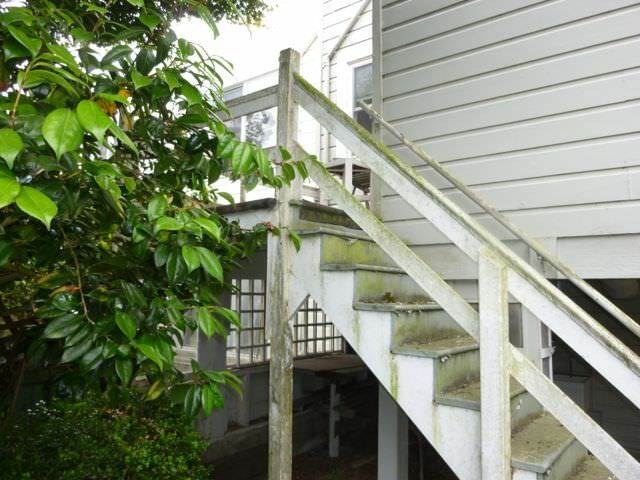 Specifically, either the post rots out or the concrete footing will start destabilizing due insufficient depth and girth. Day 1, old wall is removed and area excavated. So how do you make a standard pressure treated 15 plus year wall into a 30 plus year wall? 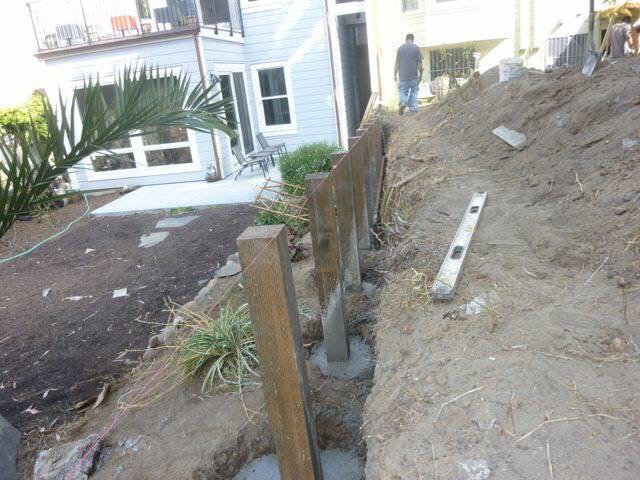 More concrete and substitute pressure treated posts with steel I-beams. 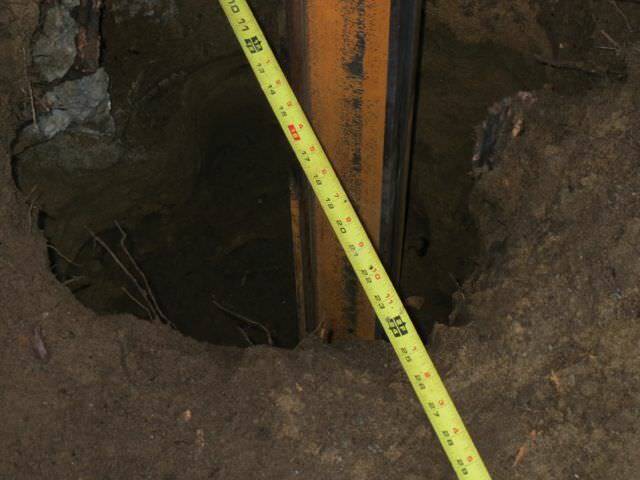 Here you see the steel post dropped into a hole 4′ deep by 2′ wide. 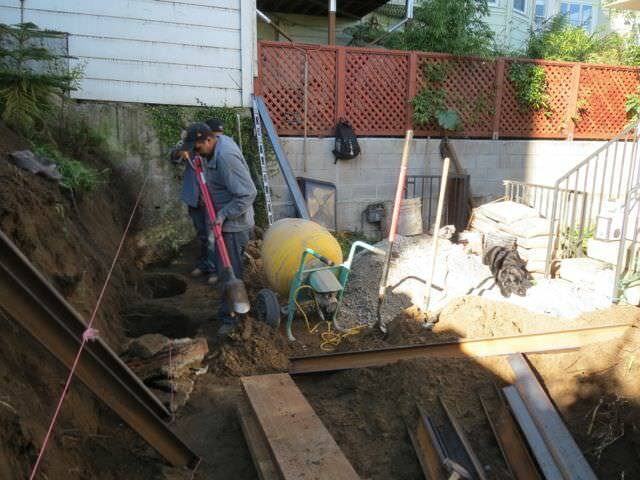 1/2 cubic yard of concrete will secure the post for a very long time. 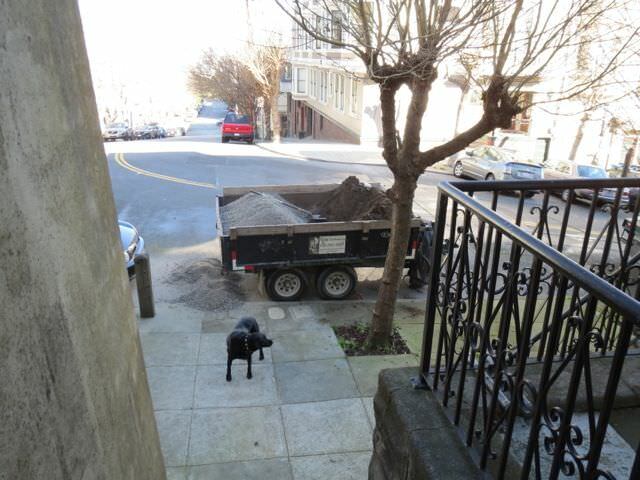 As we excavate the post holes, soil is loaded onto the trailer for dumping and concrete mix brought up. 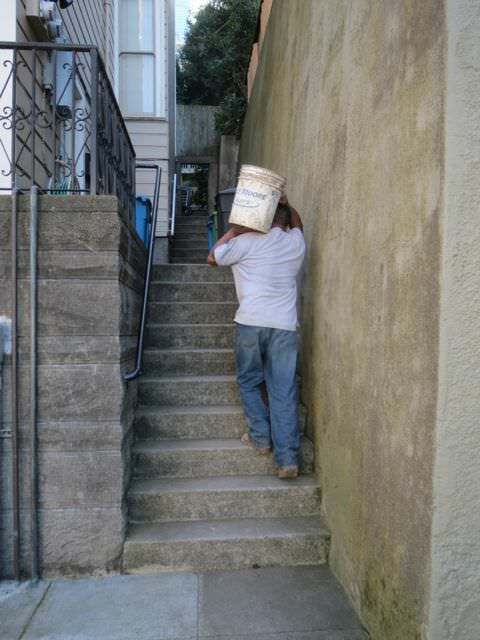 All with five gallon buckets. 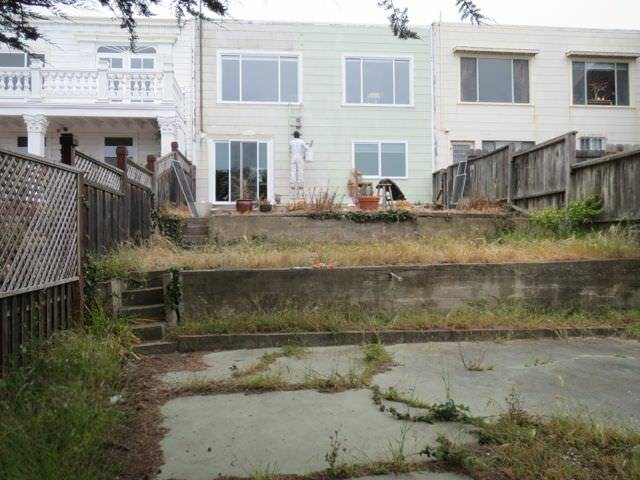 A typical San Francisco project due to limited access. 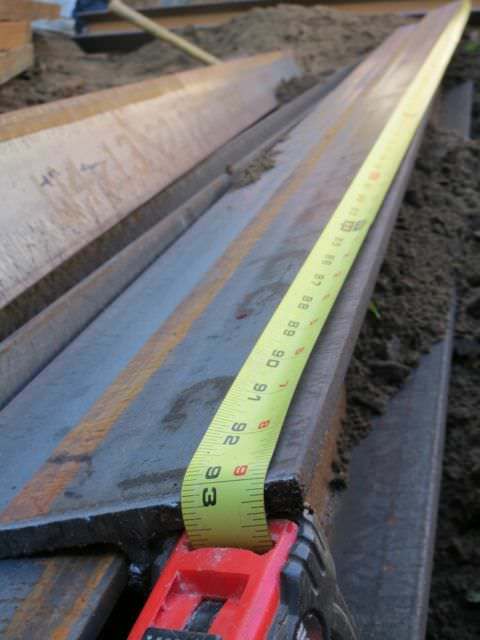 One very important process when working with pressure treated lumber is to seal all ends that have been cut. 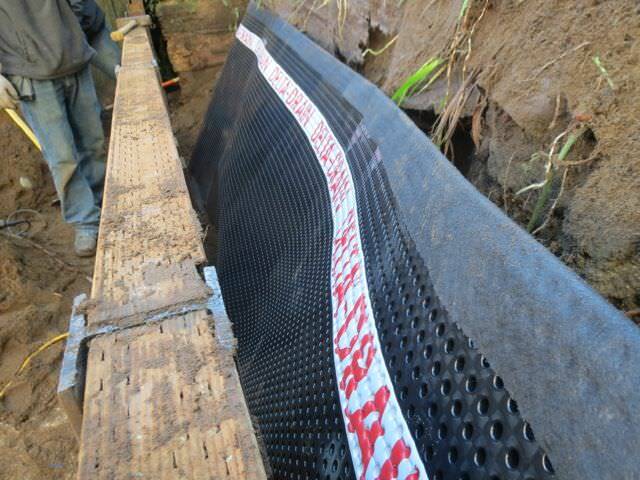 When pressure treated material is manufactured, the chemical that protects it from rot, termites etc. is only injected about 20 percent into the surface ,at best. Any cuts would leave that area open to intrusion of the elements. 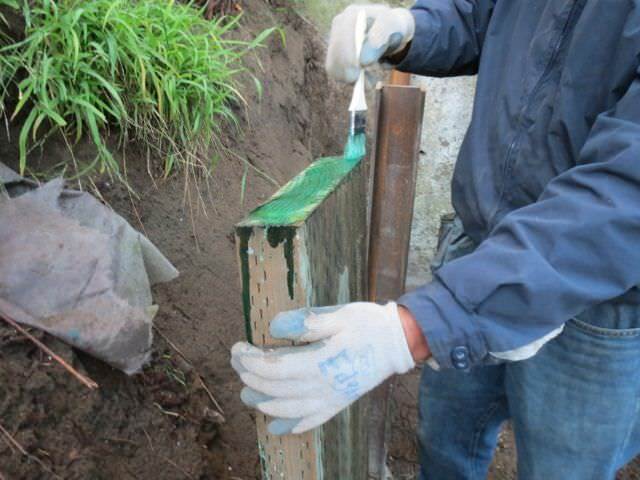 Here we use “copper green” to seal it up. 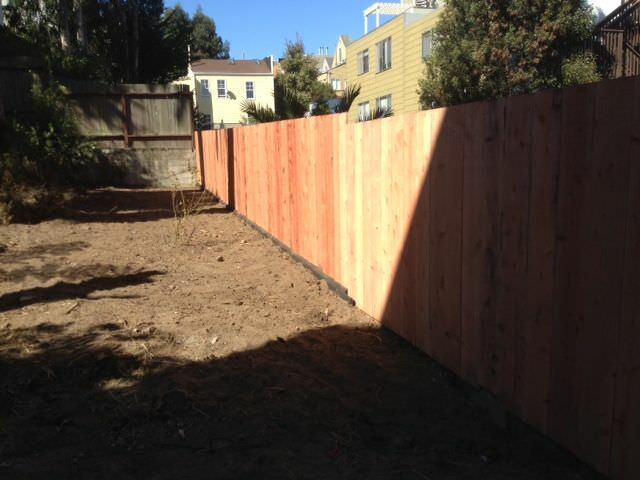 Project Complete: February 2013, Buena Vista, San Francisco California. 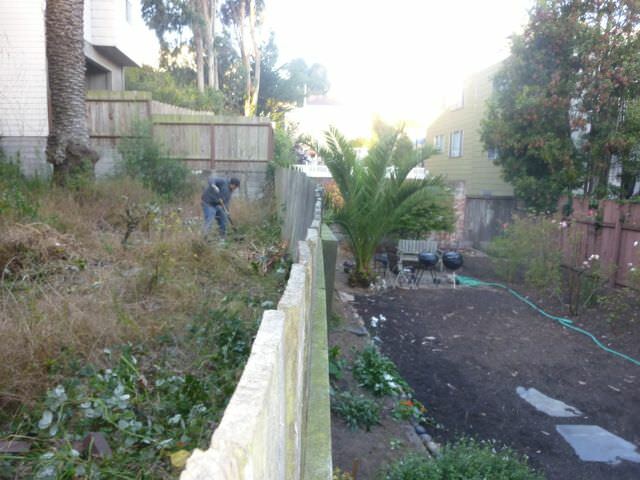 This project brings us to Baker Street in Pacific Heights where we are replacing a failed retaining wall that was installed just 15 years ago. The project is a typical example of an architictural/engineering firms failure to design a project with construction costs in mind. Since the client wanted to obtain building permits for this project, she hired Smith Engineering in Oakland to draw up plans. 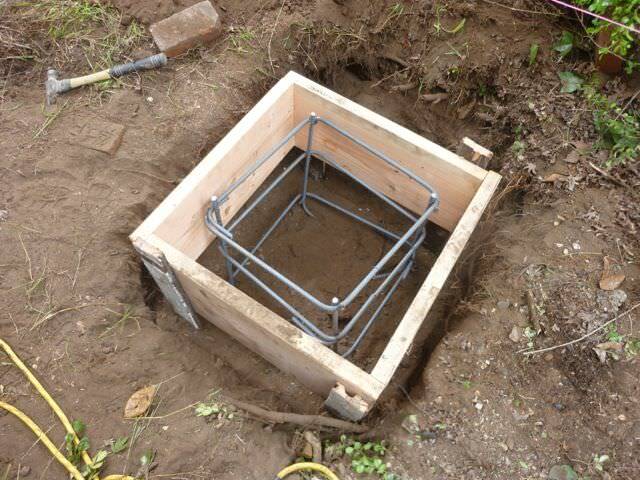 Once the plans were complete, the client proceeded to obtain several estimates for implementation. The estimates that came in were astronomical and out of reach for the client due to the nature of the design and the plans abandoned. Thats when Tamate Landscaping was called to discuss options. The original plans called for massive steel i-beams, timber and an elaborate sump pump drain system. Yes, it would have been a solid wall that would hold up 50 plus years. But any design is a failure if it can’t be built due to budget constraints. Basically we had to start from scratch and draw new plans . We ended up working with our own architect/engineer who has extensive experience working with San Francisco Department of Building Inspection as an employee there. We designed a wall that would pass DBI’s stringent permitting criteria but more importantly could be built within the clients budget. 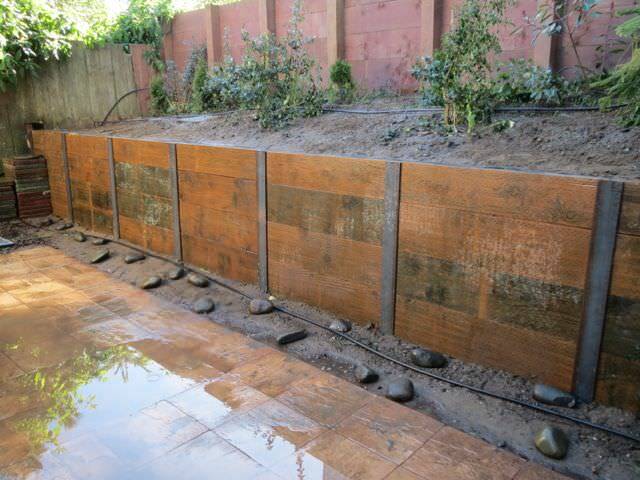 The outcome was a wall that we contracted to build for approximately 1/3 the cost of the original design. Pictured here is the failed wall bowing out. 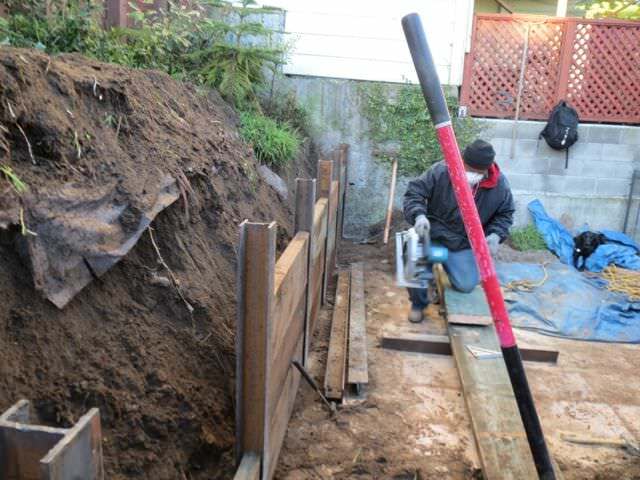 The main foundation of the new design are these 6″x6″ posts that were sunk in a hole in excess of 4′ deep and 18″ wide and back filled tons of concrete. September 28th, 2012. The end of the 6th day on site. 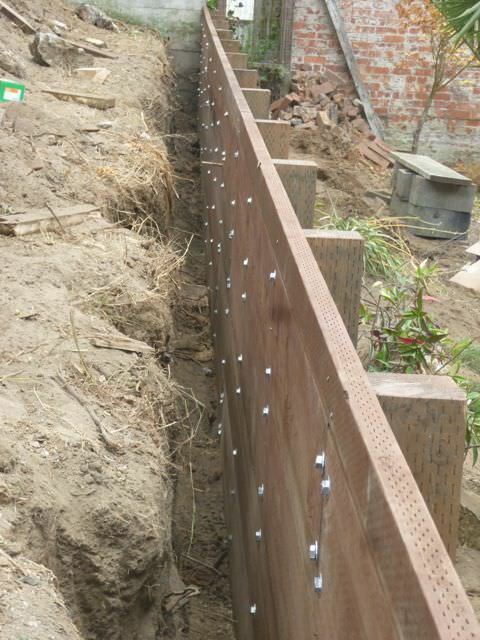 Pressure treated planks were secured to posts with 1/2″ bolts. 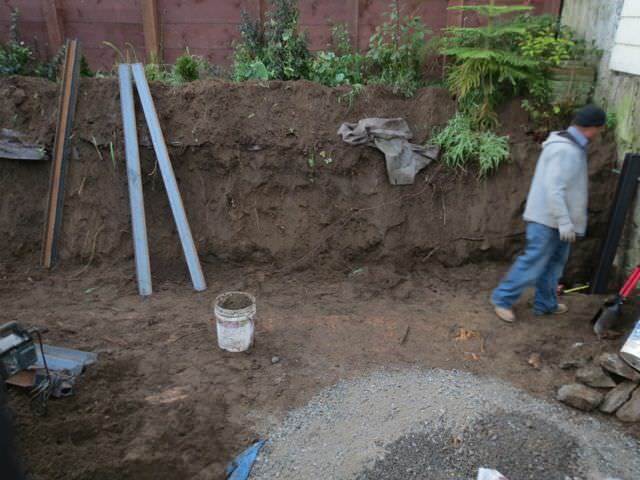 To date we used almost 4 yards of concrete just to set the posts. This wall won’t be budging for quite some time. 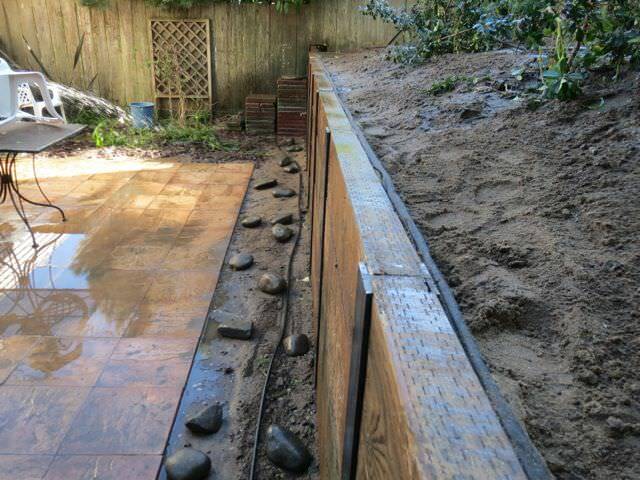 Next week we’ll be adding a Mira drain system to keep hydrostatic pressure off the wall and finish the project with a redwood fence and final inspection..
Below, a Mira Drain system is installed. 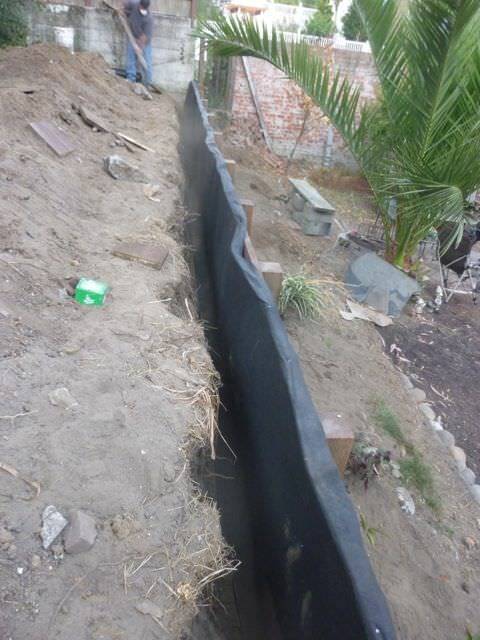 Basically, Mira Drain is a multi layer membrane with channels in between to allow water to stay of the retaining wall and travel down towards the base of the wall. Typically, this water is then collected by an additional drainage pipe and directed out of the vicinity but in this case, with the sandy soil, is readily absorbed into the ground. 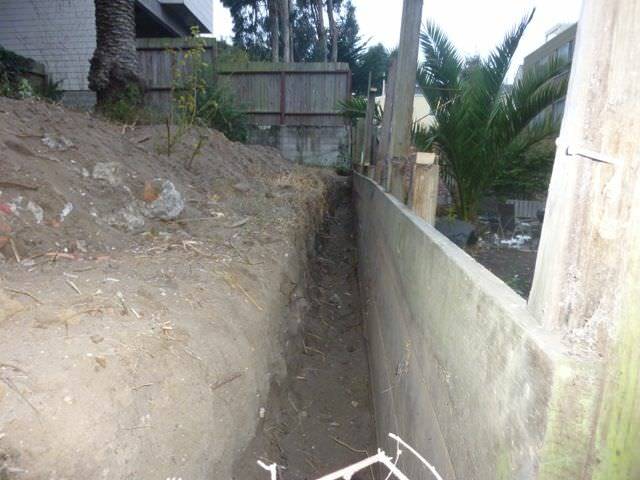 Project is completed by backfilling the ditch and building a redwood fence on top of wall. August 20th, 2012. 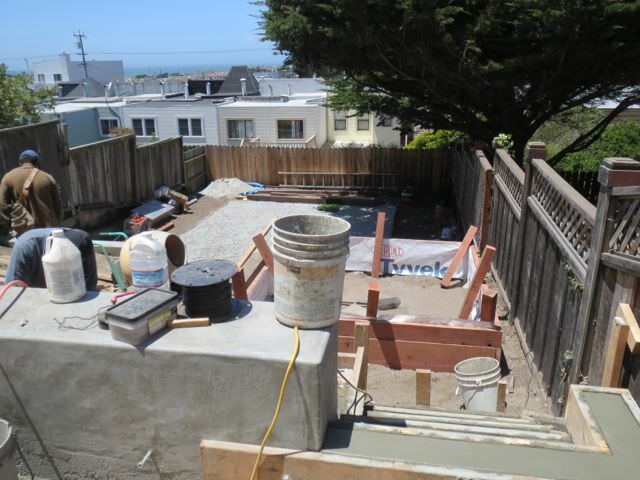 This project brings us to the Ingleside district of San Francisco where Tamate Landscaping will be replacing a deck and stairs. The client wanted building permits so our architect/engineer has been working on plans and navigating the complex bureaucracy of The San Francisco Department of Building Inspection. 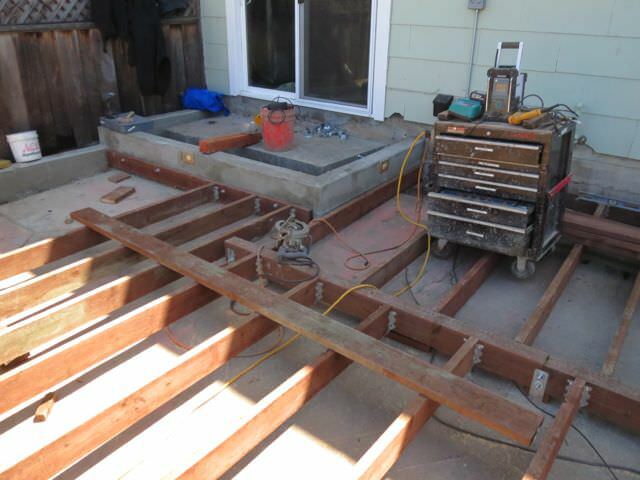 It took approximately 5 weeks from when we were hired to the start of the deck project-anybody who has tried to get a deck permit would know how amazingly quick that is. 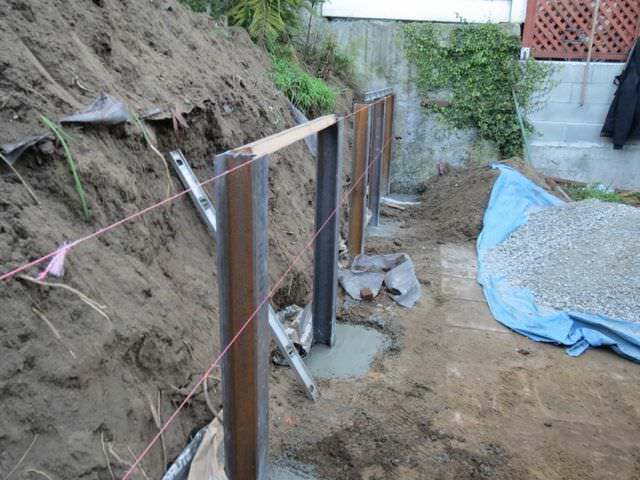 Project Update: August 24, 2012, end of day 4, the forms for the post footings are installed and concrete poured. 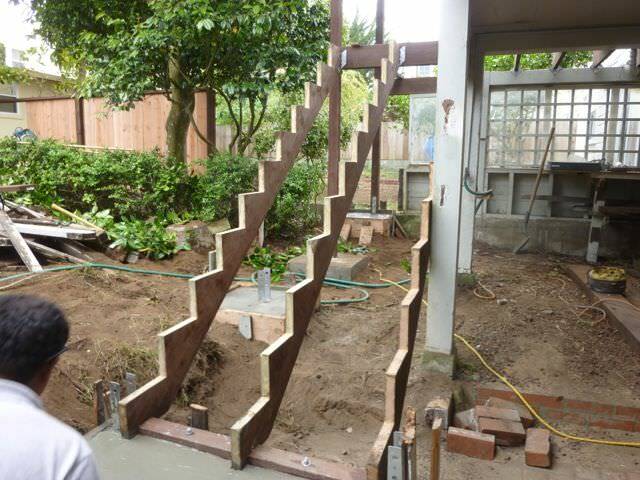 This larger footing is what secures the stairs to the ground. 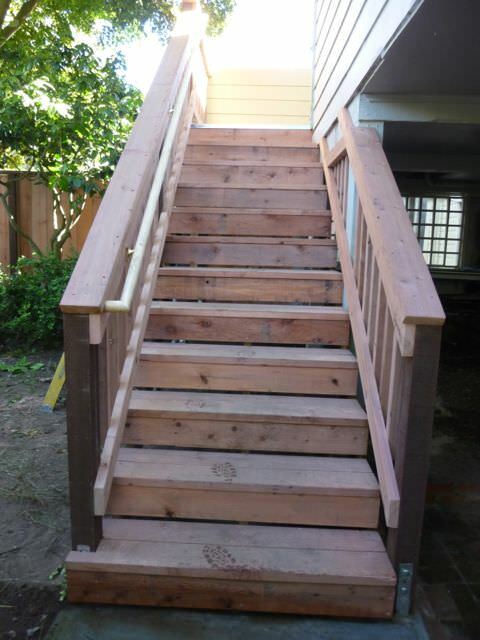 Stairs stringers are cut and secured to footing and deck joists. 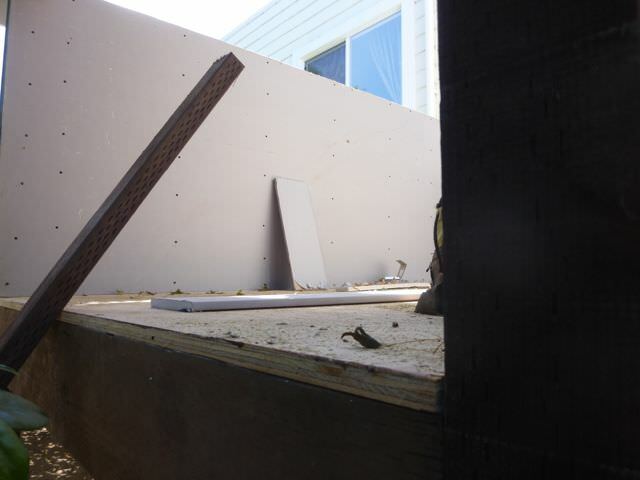 Building a simple deck in San Francisco can become a complex project due to San Francisco Department of Building Inspections abundant codes, requirements and restriction. One of these requirements for this particular project is having to build a 1 hour fire wall since the deck abuts the property line. Here you see the fire wall in construction. Its basically a wall with 2″x4″ framing with a layer on both sides of fire resistant sheet rock and another layer of cement board. Project Update: August 31, 2012 Project Complete. Final DBI inspection signed off.